Designed for growing the skills for doing ethnography overseas. Learn a "Rapid Ethnography Process" for understanding the points of organizing local tours, interview sessions and analysis workshops over the course of 7-10 day training period. Create detailed plans for research design, recruiting, and scheduling based on project themes. 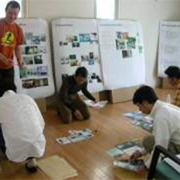 By using a session format, we are able to share the project flow among members and deepen a joint understanding about the theme.